Are you a predoctoral student interested in clinical and translational research? The CTSI TL1 Predoctoral Training Program provides predoctoral trainees with the skills required to develop a career in multidisciplinary clinical and translational research. The program uses a team-science approach and provides mentoring and didactic training for predoctoral students performing clinical and/or translational research in health-related fields at UF. 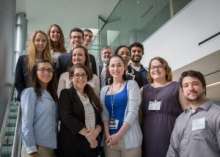 Present their research at the annual Translational Science (Association for Clinical & Translational Science) conference during each year of TL1 funding, and at the annual CTSI Research Day each year until graduation. Submit semi-annual progress reports during the funded period, and annual progress reports thereafter until graduation. TL1 Trainees will be expected to identify at least one other TL1 Trainee as a research collaborator. TL1 Team members must be pursuing their PhD degree in different PhD programs in different colleges. Applicants must be U.S. citizens or permanent residents per NIH policy and entering their second or third year of doctoral graduate study. Students from populations underrepresented in the biomedical, clinical, behavioral and social sciences are encouraged to apply (more information). Doctoral students from all UF PhD programs are eligible to apply, as long as their dissertation research is relevant to human health. Applicants must apply in the first or second year of PhD studies, prior to defending their dissertation proposal. Team specific aims must be added to doctoral dissertation research. Applicants should have strong academic credentials and good communication skills. Applicants must be able to commit to all course and research training requirements of the training program. Applicants must propose a research project relevant to human health, which should include at least one component of clinical and/or translational research as defined by the NIH. Applicants should demonstrate an interest in developing a career in multidisciplinary, translational biomedical research. Applicants must have strong mentor support. TL1 trainees will initially receive one year of funding, including a stipend (current year level: $24,324*), tuition waiver and health insurance; $2,500 for lab and training-related expenses; and a $1,500 travel allowance to attend and present research at the annual Translational Science conference. A second year of funding may be awarded based on performance, progress and available funding. Contact the program with any questions at training@ctsi.ufl.edu. *If a TL1 trainee’s current stipend is above $24,324, their mentor should supplement the stipend from non-federal funds to the original stipend level. Supporting materials from proposed TL1 Team mentors: joint letter of support and mentoring plan; NIH Biosketches. Finalists will be interviewed by the TL1 Advisory Committee. New applications must be submitted electronically to sgard@ufl.edu by 5 p.m. on Friday, May 17, 2019*. Paper documents will not be accepted. All sessions and workshops will take place in the Office of Biomedical Research Career Development Office located in CG-72. If you have questions about the program, please contact Susan Gardner at sgard@ufl.edu.